Dolores was born in St. Henry, Indiana, on February 4, 1921, to William and Therese (Fritch) Kuper. She married Jerome F. Habig on June 24, 1947, in St. Joseph's Catholic Church in Jasper, Indiana. He preceded her in death on February 6, 2013. Dolores was a 1939 graduate of Jasper High School and a graduate of Lockyear Business college. She worked in Evansville and Jasper before becoming a "stay-at-home Mom" for their five children. She did volunteer work for Scouting, especially for the Girl Scout Day Camp. 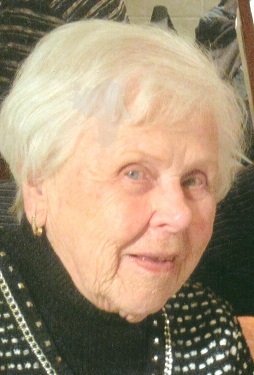 She served on the Jasper Public Library Board for many years. Her interests included spending time with her grandchildren and great grandchildren, reading, flower gardening, and playing cards, especially bridge, and mahjong. Through the years, she also belonged to many social clubs. She was a member of St. Joseph's Catholic Church in Jasper, the D of I, St. Ann's Society, American Legion Auxiliary Post #147, Dubois County Museum, ROJAC, and Friends of the Library. Surviving are two daughters and three sons, Cindy (Steve) Roberts, Greenwood, IN, Sarah (Keith) Faller, Carmel, IN, Steve (Susan) Habig, Jasper, IN, Dr. Mark (Carol) Habig, Indianapolis, IN, and Luke (Beth) Habig, Indianapolis, IN, seven grandchildren, seven great grandchildren, four step grandchildren, 11 step great grandchildren. Preceding her in death besides her husband are two grandsons, Phillip and Andrew Faller, one brother, Maurice Kuper, and one sister, Sr. Bernice Kuper, Sister of Providence. A Mass of Christian Burial will be held at 11:00 a.m. on Thursday, February 14, 2019, at St. Joseph's Catholic Church in Jasper, Indiana, with burial to follow in Fairview Cemetery in Jasper, Indiana. Memorial contributions may be made to St. Joseph's Catholic Church or the Jerome and Dolores Habig Family Endowment at the Dubois County Community Foundation.